Sun. Sept 9th.  17C  Our decision to decamp prior to having a hearty breakfast was a good one. The morning sky was calm and the air crisp  by 6:30 am, the gear we no longer required for our journey was returned to the van and our canoes were equally loaded. We faced a long day ahead of us. 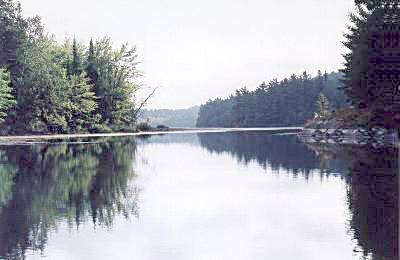 By 9 am, with the promise of sunny skies, we entered Charlton Lake; our canoes glided along, disturbing the lakes mirrored-surface as we were enthralled with the magnificent view of rocky shorelines, islands, and hillsides  the grandeur of the Canadian Shield. Cottages would occasionally be seen as we paddled among the islands and narrow channels towards the open water of the lake. Two hours of paddling brought us to the end of the lake and the entrance to Howry Creek, a lily-laden wetland that eventually led us through a serpentine channel deeper into the interior. A sharp-eyed blue heron spied us from afar and launched into the air with majestic wings spread wide as it soared into the river valley to divert us from its nest. As we rounded a point, we were greeted to what we presumed to be a lake, but now it was choked with vegetation and diminished by 3-4 feet in water level due to the summer drought. We forged ahead for the next two hours, occasionally straining our paddles on the murky riverbed, as we followed the twisting, narrow stream. Around a hairpin bend in the stream, we interrupted a beaver busy constructing a dam (1BD)  we approached quietly and were granted the privilege of a brief moment to observe him before he angrily slapped the water with his tail and disappeared - there was no resentment on our part until we were forced to off-load some of our equipment in order to pull our canoes over his creation. 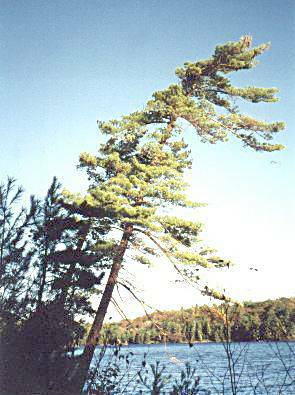 A sign nailed to a tree indicated that we were near our first portage (1P210) and our official entry into the confines of Killarney Provincial Park  what was only an idea a few months ago, was now a reality. At the portage (1P210), on the first jaunt, we carried our backpacks and bags that allowed us some time to acquaint ourselves with the terrain before returning for the canoes. Howry Creek had also drastically diminished with tree stumps and logs evident everywhere as we skimmed over the shallow waterway - the area displayed a pastoral charm. 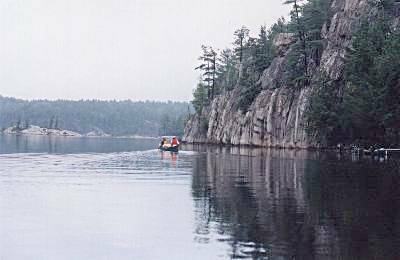 The rock cliffs, although not as high and abundant, reminded Norm H. and John of their passage through the Barron Canyon in Algonquin Park that summer. As we entered Murray Lake, the ridges, consisting of quartzite rock intermingled with sparse coniferous trees, became a common sight during our travels. From a distance, canescent rock on the hillsides took on the appearance of deep snow. At the portage (2P1090) leading to Leech Lake, we met two canoeists who suggested that we alter the next days course by undertaking the much easier portages to Cat Lake and the majestic Howry Lake and then on toward Great Mountain Lake, instead of passing through the many smaller lakes and portages on the northern boundary of the park. We had previously discussed this alternate route and agreed to heed their advice. The portage to Leech Lake brought us much closer to the expected challenges of wilderness canoeing as the inclines and declines were much steeper, rockier and rooted than we had previously experienced during past ventures. 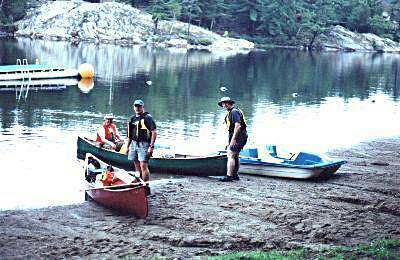 We were beginning to appreciate the ruggedness of this terrain with the loading and unloading of the heavy equipment from the canoes - the waters rocky, slippery shoreline did little for maneuverability. At one point, overlooking Leech Lake, we noticed two quaint cottages, one on an island, and we wondered whether they were privately owned or being used by park officials in this remote area. As the sun was indicating that mid-afternoon had passed and the time allotted for cooking with it, we eagerly ate trail mix and power bars, as our destination was only an hour away. At the end of our portage (3P150), Norm R. and John found themselves pushing with their paddles and jerking their bodies back and forth in order to move their canoe along the thick, slimy muck and out into deeper waters onto Hanwood Lake. 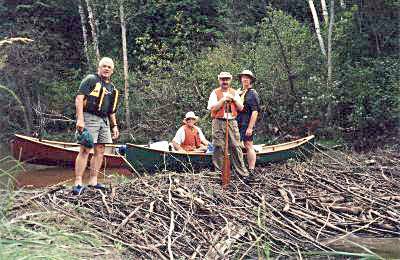 Another alternative was to lighten the load - Wayne undertook this task alone and then retrieved Norm H. along the lakes shoreline. The water in Hanwood Lake was much deeper and cleaner - a temptation for a refreshing swim! As we paddled along its steep rocky shoreline, the ambiance offered total solitude as we made our way through a gorge. 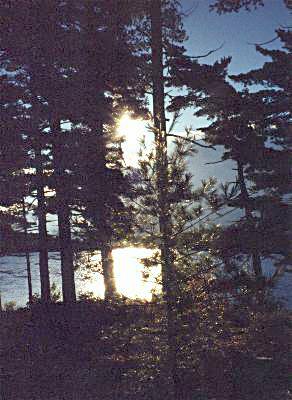 At an occupied campsite on an island, the gentleman indicated that the next portage (4P120) at the end of the lake was short in distance, but brutal with its harrowing climb. In retrospect, the exhilarating view from atop overlooking the lake was reward enough for the strain experienced. What was soon to become our theme throughout the trip, Wayne echoed out, at this moment, "this is what it is all about". On Van Winkle Lake, we scouted the first campsite situated on a small island, but found it to be unprotected from the wind and with little firewood. Passing by a peninsula and along a narrow channel further down the lake, a much larger island came into view, (1Site 145), with a small beach, plenty of firewood, and two tenting areas; however, still open to the elements. This would be our home for the night. After setting up camp, we all went for a quick swim in the cold water  staying long enough in the water to become acclimatized to it. Famished from our day of paddling and portaging, we snacked while preparing a warm multi-course supper. The increase in the winds velocity from the east required the installation of tarps over the kitchen area. Rain began in earnest as we commenced to eat supper. We could hear thunder in the distance and the ferocity of the winds was considered near gale force. Our tents would have bounced around like rubber balls if they had not been anchored properly  we were very fortunate that we did not meet these headwinds during the day. As we sat comfortably in our tents under the pine trees, we could hear their cones falling helter-skelter - some bouncing off of our tents. The force of the sweeping wind became so strong that the sides of the tents and corner poles began to bellow and bend inward hitting whomever was on that side of the tent. Several times we thought that the tents were going to either collapse or roll into the lake, taking us with them. Throughout the night, we would hear the full-fledged thunderstorm circling  each time the thunder and lightning intensified, we readied ourselves for the worse. The wind became deafening  as it ravaged through the pine trees - and we were unable to get any sleep that night. We would later learn that this storm was the carryover of Hurricane Erin from the Maritimes.